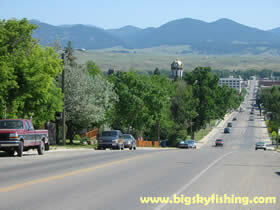 Lewistown is a town in that most people who visit Montana never see. Lying out in the middle of Central Montana, Lewistown is quite the distance from all the major tourist destinations in the state. And this is too bad, since Lewistown is a surprisingly nice town. The downtown is clean and historic, the streets are tree-lined and the location of Lewistown is excellent for anyone who enjoys outdoor activities. Lewistown is located pretty much in the dead-center of Montana, and is about 100 miles to the east of Great Falls on US Highway 200. Billings, the only other nearby major city, is located about 120 miles to the south, on US Highway 87. Although Lewistown is located in Central Montana (which everyone often thinks of as being “flat”), the town sits in a very scenic setting. The Judith Mountains, which are a small mountain range, are located just to the north and east of town. The Big Snowy Mountains, which are a very scenic mountain range and rise well above timberline, are located just 20 miles south of town. And, about 40 miles southwest of town, the Little Belt Mountains rise up off the valley floor. 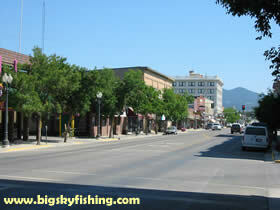 Lewistown is part of Fergus County, Montana. The whole county has a population of about 12,000 people. Lewistown itself has a population of 6300 people. Fergus County, like most other counties in eastern Montana, has been losing population over the years as agricultural consolidation has required fewer people to live and work on the farms and ranches. However, Lewistown has avoided the fate of the other small towns in the county in that it has managed to avoid losing population. While Lewistown is still an agricultural community, the city has developed a diversified enough of economy that has allowed it to whether the storm of the shrinkage of the agricultural economy that has been occurring in many areas of Montana. Downtown Lewistown is very nice, tree-lined and clean. While there are a number of empty store-fronts here and there, by and large, downtown Lewistown isn’t like many other eastern and central Montana towns that are frequently half-empty. Moreover, downtown Lewistown is a busy place – especially during the summer months. US Highway 200 – while not heavily used by out-of-state visitors – is frequently used by people who live in-state and by truck drivers going between Great Falls and Billings. Lewistown is a very functional town. By this, I mean that Lewistown hasn’t developed as a tourist town. Thus, people passing through won’t find much in the way of specialty shops or tourist traps. Additionally, you also won’t find much in the way of fast-food restaurants nor will you find a Wal-Mart. While Lewistown is a nice town on its own, one of the biggest draws to the area is the excellent outdoor recreation that exists just outside of town. The angler will find excellent fishing in Big Spring Creek, an absolutely gorgeous and restored little river that also supplies Lewistown with its entire water supply. Other nearby fishing holes includes the Judith River, Ackley Lake and Crystal Lake. The hunter will find excellent habitat around Lewistown for mule deer, whitetail deer, elk and game birds. The only thing the city really lacks in the outdoor activity department is a close ski area. Showdown Ski Area is the nearest ski hill, but is located a rather long 2-hour drive away. Overall, Lewistown is a nice little town that is well worth visiting. Lewistown sits in a very scenic area of Montana and is located within an easy drive of many excellent outdoor activities. For the visitor to Montana who wants to see an area of the state that not many people form out of state ever see, and who also wants to avoid the typical tourist areas, be sure to take a drive down Highway 200 and check out Lewistown and the surrounding area.